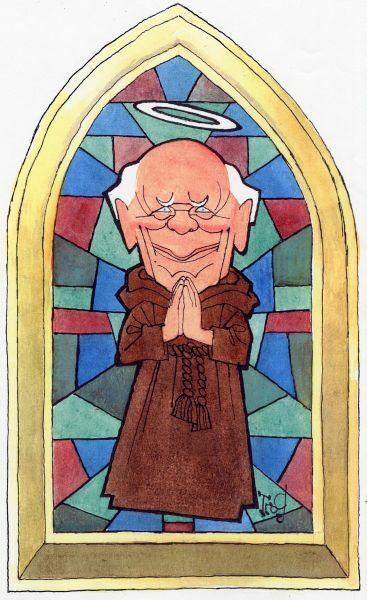 Evidently, no one asked Malcolm Muggeridge what he would do were he suddenly elevated to the papal throne; nonetheless, the indomitable journalist, not even Catholic at the time, offers his fantasies on the prospect. “If I Were Pope…” appeared in The National Review, June 9, 1978, the so-called “year of three popes,” during which Pope Paul VI died, Pope John Paul I was elected and reigned for one month before dying, and Pope John Paul II was elected to an influential 27-year papacy. As Pope Francis begins his pontificate after the resignation of Pope Benedict XVI, perhaps it is appropriate to revive Muggeridge’s conservative ruminations on a few ecclesiastical matters. Muggeridge joined the Catholic Church in 1982. He died in 1990. His papers (SC-04), comprising manuscripts, correspondence, videos and memorabilia, are archived at Wheaton College Special Collections in Wheaton, IL.